Unfortunately, we ‘members of the public’ are only insured to work in the Park when a Council employee is present, so the Friends of Dyke Road Park can’t organise more than one official Saturday ‘work party. However, Steve the gardener is grateful for any help we are able to offer during the week. If you are available to deadhead roses, or keep the weeds under control, do get in touch with him. His work mobile is: 07771 389 427. It gives you quite a ‘work out’ and a terrific sense of achievement. It’s got to be better than the gym! I have been woken early by gulls yet again, so I thought I’d see if I could send them away using sound. Gulls don’t have many predators but I remember seeing a TV wildlife documentary where Arctic Skuas ate gulls’ eggs and chicks. I tried playing them a few recordings from the web, and now they’ve not come back but this is hardly a conclusive experiment. Is it worth getting out of bed and finding the recordings every day? I found recordings on the RSPB site and on National Geographic. Would anyone else like to try it and report back whether it works for them? 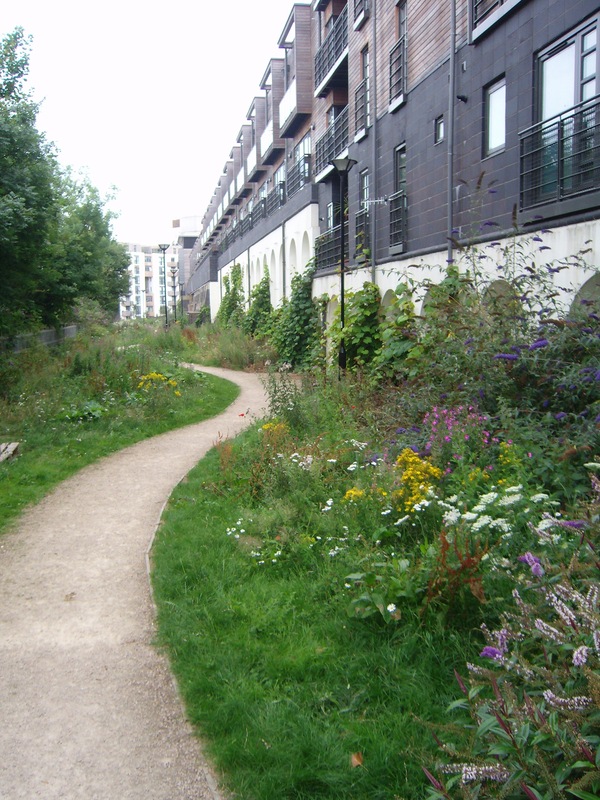 The Northern Greenway’s rangers are inviting people to come and help give it a summer clear-up next Sunday, 24 July, 1-4pm. This actually sounds like what the Greenway needs. It looks nice, but people are reluctant to use it because it feels unsafe. And that ultimately is because it runs through a thrown-together development that has little real connection to it. The Greenway doesn’t feel like it ‘belongs’ to anyone or has anybody looking after it. Citizen gardeners won’t make up for that, but trying to involve them is a worthy effort that recognises the problem. The PCA has been in touch with Preston Park’s councillors about the issue of safety on the Greenway. We and they would welcome your comments. Despite light rain (more a heavy mist, really), six of us did some satisfyingly productive work in the rose garden – dead-heading the roses along the border, and in two of the triangular beds. Getting into the triangular beds required lying along the yew hedge and rolling over into the bed, which was an interesting experience! The roses look much better, so do go and admire our work, because it won’t last. They’ll need doing again before long! We also cut down another dead shrub and cleared dead ivy from beneath it. At 11.30 the heavens opened and we decided to finish, but we were grateful that we’d managed to get in an hour’s work before that. Next work party 20 August for those not on holiday. If anyone is available during the week to work under the instruction of Steve the gardener, feel free to get in touch with him in the park. I have his work mobile, which I can give to anyone who contacts me directly. This is your chance to contribute in a practical way to keeping the Park looking good. Join in a gardening work party at 10.30 on Saturday 16 July. 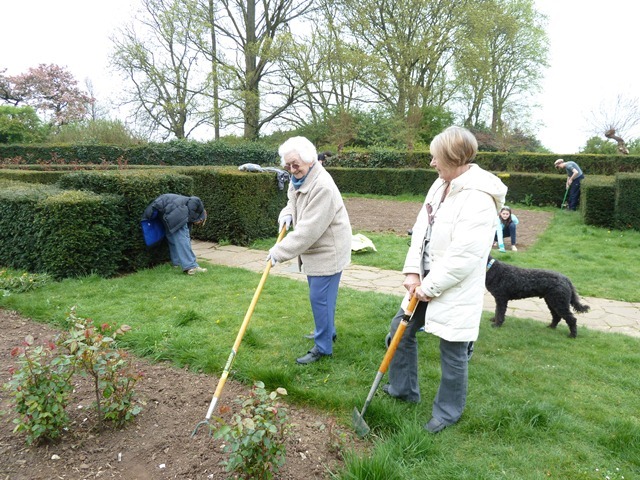 We will be cutting back dead shrubs and clearing the ground beneath, and weeding the new lavender beds. Here are the minutes of the July meeting. Matters discussed included plans for the next gardening work day, for improving biodiversity in the park, for retaining at least some of the roses in the rose garden, and for holding a dog show. If you want to get involved in any of the above, come along to the gardening work day on 16 July, 10.30 outside the cafe, or the next meeting on Tuesday 2 August, 6.30 at the cafe. Our thanks, as always, to the Dyke Road Park Cafe for providing us with a venue and with refreshments. Without them it would a lot harder for us to continue our work.